Toofeze® is recognized for its cutting-edge design and ability to soothe, calm and comfort fussy teething babies. 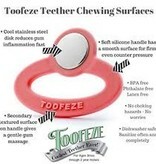 Three distinct chewing surfaces made of food-grade ingredients. Stainless steel disk chills instantly in cold water for quick symptom relief. Soft silicone handle is never too cold to hold. Smooth contoured shape enables firm counter-pressure against erupting teeth. 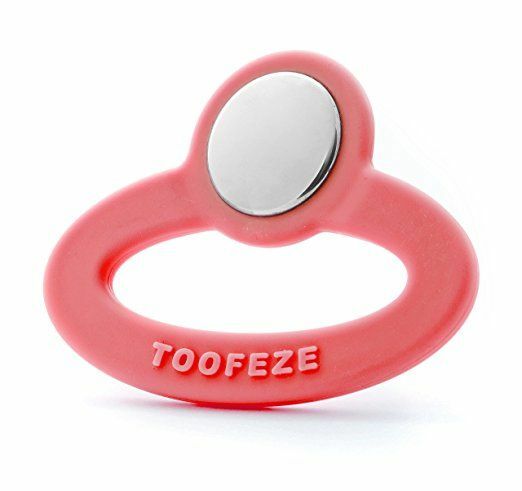 Toofeze® allows babies to self-satisfy and self-manage their changing teething needs (including 2-year molars). No Choking Hazards - Dishwasher Safe!